It has been a pretty mild winter here in the Northeast of the US. These little flowers have started popping out already. I am not sure what they are, but they hang like little light bulbs. It always amazes me that flowers like this shrivel up after summer heat and just “die”, to be completely covered in frost, ice and snow for months. The landscape bleak and frozen. Yet inside each of these is “intelligence”. Universal intelligence that knows exactly what to do and when. It understands when the weather is getting too hot, too cold and when it is just right to bloom. However, if you dig it up or squash it, it seems just like mush. Juicy mush and seems like nothing. However, within that mush there is knowledge and intelligence. That same intelligence is in everything, including ourselves. That little flower bud understands and it trusts. Trusts that spring will come and the time will be right to bloom. Nothing rushed and probably with no STRESS. The same can be applied to our life situation and our own bodies. Trust that your body has that same intelligence to survive and thrive. Your only job is to provide the right environment for that intelligence to survive and thrive! Lovely capture of these flowers! I certainly agree with you about the intelligence we all have – maybe this will be the year we all tap into our higher selves. Yep that would be nice. Us humans like to have fireworks and marching bands in order to convince ourselves we are part of this. However, it is these small little things that are sometimes the most powerful when we stop and contemplate. Thanks for comments as always Gina. Always love snowdrops! They are delicate! Powerful words and great shot of these Snowdrops! Very Beautiful !!! I can’t wait to take my shot also at these amazing spring flowers, it just seems that I have to wait a bit longer as winter just doesn’t want to go away. I hear you. We have snow forecast for tomorrow so weather is all over the place. 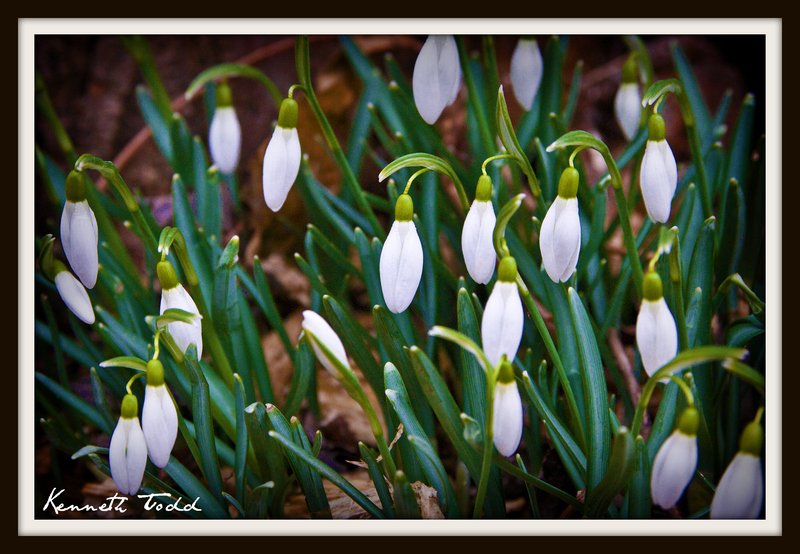 These snowdrops were so small I nearly broke my neck trying to get to see the angle through the viewfinder. I used a Tangerine box as my tripod, as it couldn’t go that low :-). Look forward to seeing your photos. Your photography and words are so inspiring! Thanks! Thanks Catherine for kind words. When you are shooting close ups like flowers. Get right up close, but the key ingredient is of course sharp focus. You cannot do that without a tripod, even if you think you have a steady hand. For these snowdrops, I actually walked back home as my tripod couldn’t go low enough and I took with me an old Tangerine crate 🙂 and used that as my tripod. Improvise. You photos are very cool. I love your cottage and I lived in the UK for 6 years, so some form of nostalgia creeps back when I see building like that. Thanks again. Snowdrops are my favourite flower. I always encourage people to get down to them and, when they are open a little more, take a look inside. they have the most wonderful green lines painted inside – something you don’t get to see unless you make the effort. Shame that such beauty is lost on so many people who don’t take a deeper look. Go on, try it for yourself and take another photo. I’d love to see the results. Will try it out Kate, thanks. Lovely photo! It reminds me of something but I cannot pull up the name from memory just now. Thank you for stopping by my site and for the like to my blog on Opie. Didn’t you just love the flying photo?